The festival said Agnieszka spent time researching filmmakers, their films and developing her own techniques. 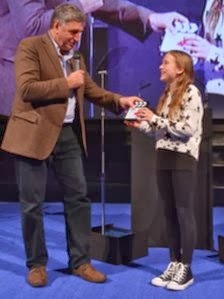 One of the festival's judges Jim Carter, who plays butler Carson in the ITV drama Downton Abbey, said it was brilliant to see children so passionate and confident about film. "I presented the ones to watch award, a boy and two girls who have made their own films, produced, directed, and written them," he added. "They are quite alarmingly good, so I was thrilled to be asked to do it and I wish them all the best in the future." Agnieszka, who has Polish roots, was first in Wales, seventh in the UK and 31st worldwide at the World Education Games spelling championships last year, finishing ahead of 1.5 million other children. Children from 200 countries took part in the event against the clock and Agnieszka, who is educated at home, had not sat a spelling test before. "If you can spell my name, you can spell just about anything," said Agnieszka after winning the prize.